From what I know so far, this is begging as a form of work, not as a way of coping with homelessness. West Mercia Police tell me there are similar begging operations in their area. The people involved may nevertheless be vulnerable. They may have ‘managers’ that control their begging and take most of the income. They may have fallen though the widening gaps in the benefits system. It has been an offence to beg in a public place for nearly 200 years, under the Vagrancy Act. In 2003, Home Secretary David Blunkett made begging a recordable offence by the police. I have never been comfortable with treating begging as a criminal offence. I have no doubt that some beggars spend their days on the streets as an easy way of earning income. Some will be exploitative not vulnerable. But in Ludlow, we mostly witness genuine homelessness, often men struggling after leaving the army. 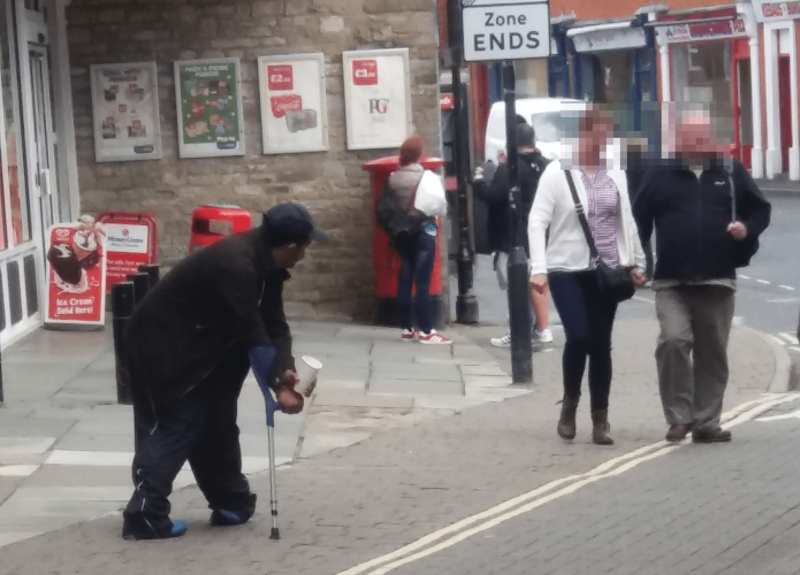 Most people begging on Ludlow’s streets will have mental health problems. Drugs and alcohol addiction will be commonplace. Many will be sleeping rough. Some will be passing through on a restless journey without a destination. At least a few will be the hidden homeless, sofa surfing or staying with friends. They will be struggling to get or hold down a job. The appearance of East Europeans on our streets is rather different. There is a suspicion that they may not be in need, as has been reported from elsewhere in the country. I would urge people to treat our visitors kindly. It is a personal choice whether to donate money but in this instance, I would advise against it. If you are concerned about a homeless person, please report the circumstances through Streetlink. If you are concerned about antisocial behaviour or crime, please contact the police on 101. Shrewsbury has taken a rather different approach to homelessness. Three days ago, a public space protection order came into force banning a range of antisocial offences, including leaving personal possessions unattended. That makes it hard for a homeless person to go to the toilet. Urinating and defecating is also an offence under the order. The police will have the powers to take alcohol from homeless people and that could drive more desperate rough sleepers towards drugs. I don’t think we should go down this discriminatory route in Ludlow. We need to understand the root causes and ensure that struggling people have the homes and support they need. If they arrive and depart by car, would the registration number/s be a starting point? If the newcomers are being exploited the vehicle details may be a help. Otherwise they may have hitch-hiked. Are other small towns seeing Romanian beggars, I wonder? Or do they head for places with the most tourists? Yes totally agree Andy with your comments. If we have a blanket policy to exclude/criminalise beggars then we will not be able to help the vulnerable people within this group who are homeless and may have mental health problems and other issues. I don’t give money but a hot drink, I hope, helps. If it is an offence, then pray why are the police not enforcing it? I wonder what will happen in such situations after Brexit.? ?